Having fresh, ready-to-cook meals delivered to your door may seem like a simple way to get food on the table. However, the supply chain behind every meal kit delivery business is both complex and time-pressured. These companies must invest more effort into ensuring seamless logistics – from sourcing the ingredients, portioning and packaging the meals, to timely deliveries. At its core, these meal kit delivery follow a subscription model. Instead of grocery shopping, customers choose their meals several days in advance from a set list of menu options. Then once a week, a shipment of fresh ingredients and complimentary recipes arrive to their homes. Forecasting plays an important role in these businesses. Some companies even plan their menus a full year in advance – instructing their network of farmers to grow crops specific to their recipes so that they can guarantee their supply and quality. As well, many services try to set themselves apart by offering a unique hook. They take extra measures to ensure standards are met so they can deliver on their value propositions. For example, some meal-kit services will promise local, organic, gluten-free, or reduced-calorie meals. The meal kit delivery industry hit $1.5 billion in sales in 2016. This is a number that is expected to grow over the next 5 years as consumers continue to embrace convenience, develop an improved perception towards subscription-based services, and become more comfortable with using technology to make purchases. Some companies like Blue Apron ship out over 8 million meals a month. You can imagine the number of links that go into this long supply chain, and every part of it needs to move at an expedited rate since the foods are perishable. This is something that poses a threat to any industry supply chain, but specific to the agriculture industry, crops can fail due to disease or poor seasonal weather. Not only is crop yield and quality highly dependent on uncontrollable variables, but that extends to the rest of the supply chain, where any segment can fluctuate due to external factors beyond control. Sometimes fulfillment centers and warehouses are not centrally located, and other times there are not enough locations to efficiently service the growing consumer base. In those cases, there is an issue of supply chain mismanagement. Meal-kit delivery companies typically prepare, package, and ship their inventory out within a week. With high inventory turnover, it is critical to research and adopt the most efficient distribution methods. As the meal-kitting market becomes saturated with competitors and consumers are moving on to the next novelty, retaining subscribers will be a challenge. Consumers have constantly changing preferences. In order to maintain a sustainable customer base, it’s to be receptive and adaptive to market changes. Otherwise, your supply chain will hit a bottleneck. While environmental disasters may be unpredictable, businesses can minimize their risks by being prepared. Although meal-kit companies who promise to source only local ingredients may have a limit in their number of contingency suppliers, it is important to maintain a network of suppliers in case one fails. Atlanta-based company PeachDish sources from over 75 farms and producers, and is able to keep up with their 20,000 meal deliveries a month. What if demand suddenly spikes? It is important to have the resources and infrastructure in place to support the dynamic supply chain. Incorporate warehouse technology and inventory management systems to your business operations to maximize efficiency. Meal kit companies need to utilize software with tracking and tracing capabilities in case a food recall needs to be issued. In this industry, responsible supply chain management ensures the health and safety of customers, as well as protects the company reputation and brand. Knowing what goes on at every step in the supply chain is crucial to logistics, forecasting, and customer retention. Many meal kit delivery services have began partnering with grocery stores to expand their market reach. In 2017 alone, in-store meal kits brought in $154.6 million in sales. Research also shows that 80% of grocery store customers want to see meal kits available in stores. 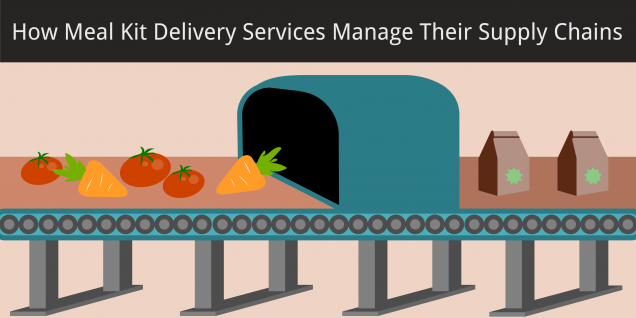 Meal kit delivery businesses have an edge over other food suppliers because they can analyze their customers’ order histories and find out their preferences. So what can we learn from meal kit delivery companies? The key is establishing an efficient supply chain. To do this, integrate technology and software available so that accurate forecasts about inventory and operations can be made. Since these companies buy their supplies in bulk, they reduce their amount of waste and are cost-effective in their manufacturing and distribution processes. Additionally, these businesses analyze the purchasing patterns of their consumers, and adapt their product offerings according to the data. Prev:Is M-Commerce Just as Important as E-Commerce?